Keep in mind that you can opt out of that blind spot! I like that a lot, but with time it could turn the whole feature useless. The same riot starters that rally the masses to review bomb a title will simply add the request to change this option in the settings. 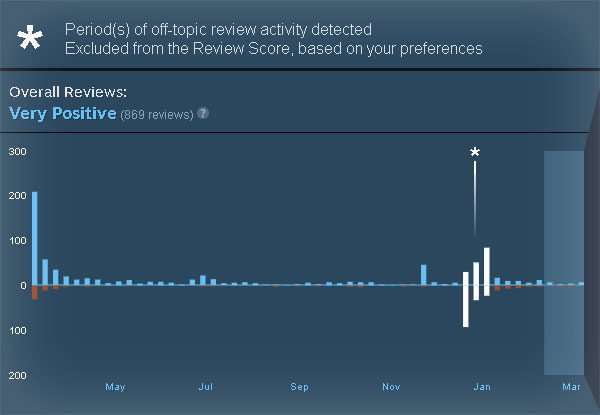 The more people see review bombs again, the more "victims" will complain. What will Valve do at that point? Turn off the whole thing or just take away the opt out? Which side will they take, being a developer and publisher themselves? And IMO the timing of this announcement and the recent Artifact news is noteworthy. A sad day for consumers. Gobo Keep in mind that you can opt out of that blind spot! I am not sure i get your meaning. The opt-out option is for people who would want to see the review bombs unfiltered. While the default is having the reviews hidden. The system does not prevent the review bombers from posting so from the point of view of the rioters opting out of the filter would have no effect. Another automated system to contain highly erratic behavior? How about adding a 'complaints & suggestions' box to the product page, in addition to the reviews? And moderating that space for high profile releases? Purple Library Guy The approach seems like a pretty fair compromise. The reviews don't disappear, nothing's being censored. And, if you're the kind of person who thinks review bombing is often justified/relevant, you can turn the feature off. That's more or less my view of it. Although I've occasionally sympathized with review bombs (never to the point of taking part, I should add), it's a very blunt instrument which makes life difficult for potential purchasers who don't care about whatever issue it is that the bombers are excited about. Valve had to do something about it, and this seems like the least intrusive solution. It doesn't hide the fact that some buyers of the game are upset - the bad reviews will still be there - while making sure that the game's long-term rating is unaffected. And I like that fact that they're not trying to automate the process beyond alerting them that a review bomb might be taking place. Whether it's off-topic or not is a fine distinction, and it's right that it should be actual humans, who can be held responsible, who are making the decision. Can't say I like this. While there are quite a few extremely silly reasons for down-voting games that make no sense whatsoever, it's now in the hands of Valve to judge and decide what reasons are legitimate. Or it could turn into a tool to please publishers. And I'm not in the slightest interested in 'critics' reviews, averaged user scores so far were far more useful and reliable than paid reviews. If there were a way to see the overall scores without what's deemed 'review bombing' removed I'd have no problem with it, but if I understand it correctly you can only opt-in see the reviews themselves. Is there any example for a title that got review bombed and those reviews get filtered now? While initially I was not happy about this change, after some thought, I can live with the change. For the most part, I do not rely on overall rating which is the only thing that this truly affects. I prefer to read the reviews to make my decision. In fact, if a an overall rating is "Overwhelmingly Positive" I make it a point to find and read the negative reviews for some objectivity. As long as all of the reviews are out there, I do not expect a big difference to how this affects my evaluation of titles. wvstolzing Another automated system to contain highly erratic behavior?